Ag Policy Advisor John McCracken speaks with area agriculture stakeholders at a roundtable Wednesday at the Lima/Allen County Chamber of Commerce. From left: Allen County Commissioner Jay Begg, Allen County Farm Bureau President Jim Hefner, West Ohio Food Bank CEO Linda Hamilton, Allen Soil and Water Conservation District Representative Beth Seibert, Chamber of Commerce President Jed Metzger and McCracken. LIMA — A representative from Sen. Sherrod Brown’s office, Agriculture Policy Advisor John McCracken, held a round table discussion Wednesday afternoon with a number of Allen County farmers and industry representatives to hear their concerns about policies crafted on the national level. Brown’s office has held 25 similar talks throughout Ohio, and McCracken said the information he has gained from the effort will go toward the formation of a 2018 Farm Bill that is currently being written in the Senate’s agriculture committee, of which Brown is a member. McCracken said Brown is looking to fine-tune the programs included in the bill — such as local food initiatives, Agriculture Risk Coverage (ARC), Supplemental Nutrition Assistance Program (SNAP) and the Conservation Stewardship Program (CSP) — before the 2014 Farm Bill expires next September. Many of those involved in the roundtable brought up worries about policy ideas put forward by President Donald Trump’s administration. Recently, Trump proposed overhauling SNAP by creating a program that would deliver boxes of food to individuals instead of allowing them to use SNAP funds to pay for food. West Ohio Food Bank CEO Linda Hamilton didn’t see how such a program could be implemented without cost increases. If Trump’s “America’s Harvest Box” program was approved, it would require a complete retooling of the current system, she said. For example, the West Ohio Food Bank currently provides food to roughly 1,400 seniors, and packing boxes would require more manpower to serve them. Trump’s program could also potentially send local dollars out of the region, and it would restrict program recipient’s access to fresh food, she said. Trump’s proposed presidential budget also included a reduction in crop insurance subsidies, which would make it more difficult for farmers to protect themselves from potential low yields. Presidential budgets, however, are never passed “as is.” They are treated more as an expression of intention by policy makers. Guardian Lima Plant Manager Jack Wolfcale said the crop insurance reduction is a popular topic for many of his customers, who have expressed derision about the policy move. McCracken said Brown’s goal is to make it easier for farmers with less acres to find success in the market. As it is now, he said, many of those in agriculture are getting squeezed out, especially as crop prices remain low and larger farms become the norm. “You shouldn’t have to farm 4,000 acres to make it,” McCracken said. https://www.limaohio.com/wp-content/uploads/sites/54/2018/02/web1_DSC_7581-2.jpgAg Policy Advisor John McCracken speaks with area agriculture stakeholders at a roundtable Wednesday at the Lima/Allen County Chamber of Commerce. 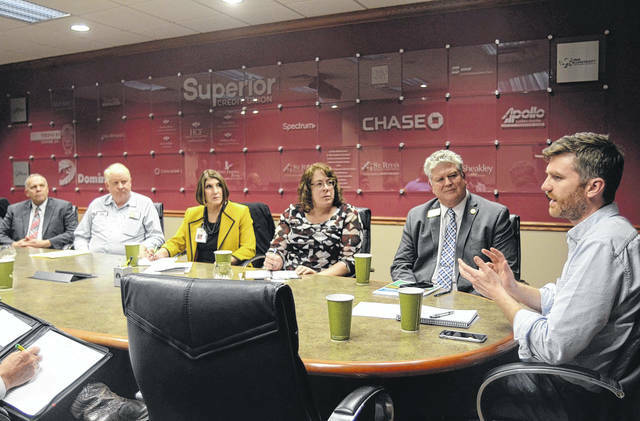 From left: Allen County Commissioner Jay Begg, Allen County Farm Bureau President Jim Hefner, West Ohio Food Bank CEO Linda Hamilton, Allen Soil and Water Conservation District Representative Beth Seibert, Chamber of Commerce President Jed Metzger and McCracken.